Explore the thriving Thai city of Bangkok with Arts & Collections. Thailand is a known travel destination for both gap year backpackers and luxury high-fliers alike. With stretches of gorgeous white sand beaches and a tropical climate Britain can only dream of having, the country offers travellers an immersive experience. Tourists can choose to explore both the rural and urban aspects of the country; Thailand’s mix of busy cities and rugged forests provide a spectrum of south-east Asian life. Thailand’s flourishing capital of Bangkok has a wealth of culture to explore. The modern and traditional sensibilities so intrinsic to Thai culture are crammed together in one space; a silhouette of city skyscrapers overlooking ancient temples. While Bangkok has a reputation for being unsavoury, wild and clamorous thanks to a rather limited representation in the media, Thai culture itself actually has a unique beauty. Buddhism is the most prevalent religion in the country with the faith reflected in the traditions and architecture dotted throughout the city. There are incredible temples sitting by the river and thousands of Buddha statues scattered throughout Bangkok. The multi-cultural mix of people in Bangkok make the city the fantastically eclectic jumble it is today. Food, festivals and fantastic landmarks together mean that Bangkok is a first-rate city of culture. 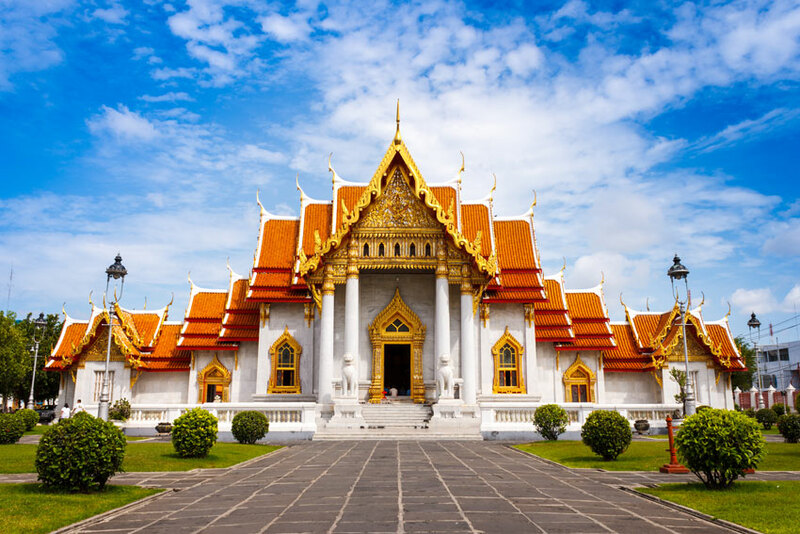 Bangkok is home to some of the most beautiful temples and ancient buildings in the world; one of the most popular being the Wat Pho temple—or ‘Temple of the Reclining Buddha’. The temple complex is hugely popular with tourists and famed for being the oldest and largest in Bangkok. The buildings themselves feature classic ornate Thai decoration. The famous Reclining Buddha is the largest Buddha statue in Thailand spanning over 150 feet long. The Grand Palace in the heart of Bangkok is an enchanting sight to see with its tall gold spires and impressive buildings. It has been the official residence of the Kings of Siam (and later, Thailand) since 1782. Official events and royal functions are still held in some of the many buildings that make up the Grand Palace. Situated on the banks of the Chao Phraya River, the Grand Palace is one of the most popular tourist attractions in Thailand. Wat Arun is a perfect example of extraordinary Thai architecture. This ‘Temple of Dawn’ is distinctive with its intricate prang (spires), which give onlookers the impression that it has risen from the ground at the banks of the river. Extensive restoration work has been completed recently to return the prang to their former glory. Wat Benchamabophit—also known as the ‘Marble Temple’—is widely considered to be one of Thailand’s most exquisite houses of worship. With white walls and a red-stepped roof, the architectural symmetry of the building makes this a national treasure. 52 Buddha statues are on display, each depicting different Mudras (symbolic hand gestures). An image of the temple can be found on the reverse of the five-baht coin—a piece of Thai currency. The epitome of Thai food can be found on the streets of Bangkok. The city is known for its numerous street vendors selling delicious pan-Asian food, and you can find everything from Thailand’s famous curries to its pad kee mao (‘drunken noodles’) dish, popular with the town’s party-goers. Yaowarat—otherwise known as Chinatown—is a sought-out foodie destination; head here for a great variety of freshly-prepared dishes. Bangkok houses numerous museums where tourists are invited to learn about Thailand and the rich history of the city. The Bangkok National Museum is located in the former grounds of the 18th century Wang Na Palace and is home to the largest collection of Thai art and artefacts in the country. The museum displays permanent exhibitions showcasing Thai history from the prehistory period to the Bangkok period. Delve into Thailand’s opulent past and explore a vast array of sculptures, gold treasures, costumes and textiles and musical instruments. The Museum of Siam attempts to answer the question, ‘What does being Thai mean?’ This question is emblazoned in red in its reception area and is explored in a variety of contemporary ways throughout the museum. Each room of the museum explores a different part of Thailand’s history, allowing visitors to immerse themselves in the many facets associated with the culture. The presentation of the multiple exhibits in this museum is what people find most interesting, with televised broadcasts showcasing the evolution of Thai TV and a life-sized reconstruction of the ‘Bangkok Café’ from the 60s. Anyone who has visited Bangkok would say it feels like an perpetual party with its loud, vibrant atmosphere. However, during certain times of the year, celebrations intensify in the form of the city’s famous festivals. Residents show their free spirits at the New Year water festival, Songkran, which takes place in April. For a full week, festival-goers take part in a wild water fight. While most people welcome getting drenched during the hottest week of the year, businesspeople and tourists often get targeted and caught unaware. Loy Krathong is a more delicate and restful festival that takes place on the night of the first full moon in November. Thai people send small, decorated floats made of leaves, flowers and candles out into bodies of water. It’s a symbolic offering to the gods to let go of grudges and anger. It can be watched from various points throughout the city for a bewitching spectacle. Every autumn the International Festival of Dance & Music in Bangkok brings well-loved shows and displays from across the world. From West Side Story to the Lithuanian National Symphony Orchestra, there are a diverse array of performances representing different countries ready to entertain the crowds. If you’re looking to get away from the busy city, consider exploring the areas of natural beauty Thailand has to offer. Erawan Falls is just a few hours’ drive away from central Bangkok and is guaranteed to provide an experience to remember. Situated in Erawan National Park, the seven-tiered waterfall is a great place for hiking, exploring and swimming. The ponds that make up part of the falls are a perfect—and safe—place to take a dip. Go during the April Songkran festival for a water fight even more intense than in the city. South of Bangkok lies the Phetchaburi province. Phetchaburi is one of the oldest settlements in Thailand and provides visitors a traditional view of Bangkok without the interruption of the modern life. Hat Cha-am is a tourist favourite with a two-kilometre beach and plenty of food vendors right by the sea. Cha-am was originally a fishing village—evident in the amazing seafood you can find there. You can’t go to Phetchaburi without visiting Tham Khao Luang—climb down the steps into a vast cave framed with stalagmites and stalactites. Inside find hundreds of Buddha statues and relics hidden beneath a natural opening in the top of the cave where sunlight pours through. For those who prefer not to travel far out of the city, Bangkok has a charming park in its very centre. Lumphini Park is an open public space with trees, playgrounds and a lake. The park is popular with joggers, and visitors can rent boats to sail on the lake. Lumphini is a rare patch of green in Bangkok where you can go for a picnic or simply to get away from the bustling city.